A California man discovered that his face had been plastered all over newspapers, local television stations and the internet after a woman saw him walking his dogs through her neighborhood, snapped a picture of him and gave it to police trying to stop a burglary ring. 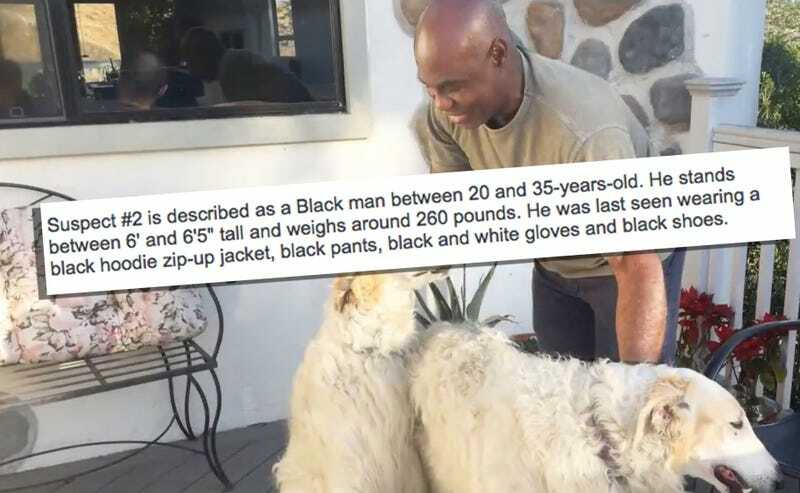 According to the Los Angeles Times, on May 16, 55-year-old Ike Iloputaife walked his two dogs, as he does every morning. Unbeknownst to him, seven hours later, a home in his San Diego neighborhood was burglarized and several rifles and handguns were stolen. A week later, the San Diego County Sheriff’s Department released general descriptions of the men who were responsible, along with photos of the suspects. All of the photos were from surveillance cameras from burglarized homes, except one. That photo was of Iloputaife. But if any of that seems preposterously white-people-ish, the story gets even more ludicrous. It turns out that the photo circulated to television channels, news outlets and the city’s Crimestoppers website came from one of Iloputaife’s neighbors, who secretly took a photo of him before the crime even occurred! It is entirely possible that this woman is not racist because, apparently, this is a thing that white people do. Maybe she watches black people and categorizes them the way bird-watchers do. Perhaps she’s creating a lookbook or a catalog of random Negroes just in case Donald Trump makes slavery legal and she needs to decide what kind of Mandingo to order from Amazon.com. Even though her motives remain unknown, the real question is why the police thought it was a good idea to release Iloputaife’s picture with no evidence. Lt. Jack Reynolds said that the San Diego Sheriff’s Department’s decision was based on the severity of the crime and the fact that they couldn’t come up with any good leads. “With a crime where we have no leads other than surveillance footage, we’re going to look at all information that comes in as a potential lead,” said Reynolds, explaining the long-standing law enforcement policy of blaming black people instead of doing police work. Iloputaife, who was born in Nigeria, was vacationing in Yosemite when the police released the photo to the public. It had been circulating for days when he returned to San Diego and a neighbor told him that he had become a local celebrity during his absence. Iloputaife, who came to the U.S. in 1981 to study engineering and compete as a competitive sprinter, says that the incident has made him contemplate moving back to France, where he holds citizenship along with the U.S. This is not the first time he has experienced the uniquely American brand of racism. He says that a man shouted racial slurs out of a truck at him while he walked through the neighborhood one day, which sounds about right. Iloputaife is still trying to contact news outlets and websites to have them remove his picture. He says that San Diego deputies have refused to return his calls and have left it up to him to clear his name. Despite the fact that neighbors called the Sheriff’s Office to inform them that Iloputaife lived in the neighborhood and often walked his dogs, the San Diego Crimestoppers website only removed the photo Monday afternoon, 10 days after police issued the picture of Iloputaife to the press. According to Justin Brooks, director of the California Innocence Project at the California Western School of Law, mistaken identification is the leading cause of wrongful conviction, noting that it most often occurs when people attempt to identify suspects of a race other than their own.